PORTOLA HILLS LIVING by Kelly Turbeville: There is nothing spooky about the Portola Hills real estate market! There is nothing spooky about the Portola Hills real estate market! 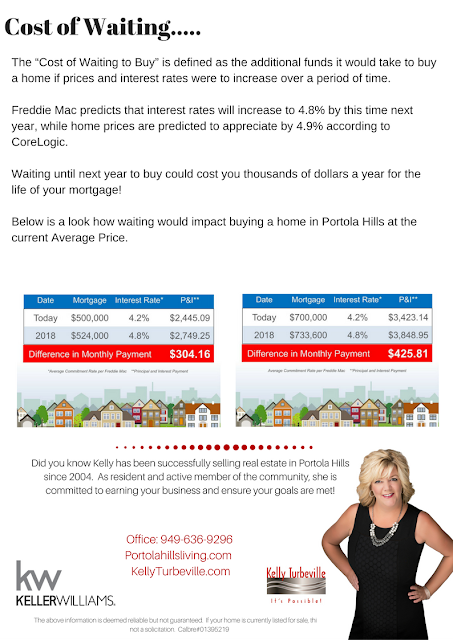 As you can see up the market continues to have price increases with the average price of a detached home in Portola Hills in September was $899,000 and for attached homes the average price was $473,000 up 11% from September 2016. The big news for Portola Hills is the new development that are currently selling new homes. The Oaks now in phase 4 and models opening soon for Iron Ridge. Residents who are thinking of moving, should keep these developments in mind as competition. In order to capture the buyers away from these homes, your home will need to be presented beautifully and priced well. After about a year, resale homes will be able to take advantage of these sales in your pricing strategy. If you are thinking of a move, don't hesitate to give us a call. Our goal is to develop a marketing plan that brings you top dollar for your home. We just put into escrow a great condo in the Montecido complex, sold the first weekend with multiple offers. Which tells us demand is very strong!